If you’re going to be audacious enough to call a car Superb then you’d better be damn sure that it is – and Skoda knew exactly what it was doing in naming its range topper. 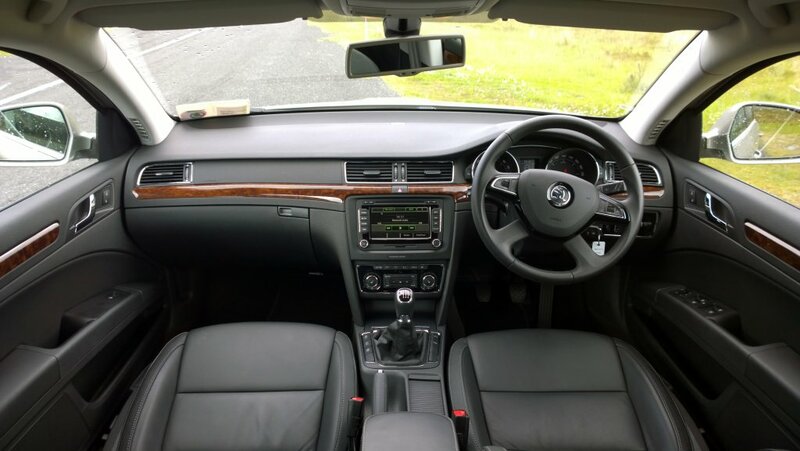 The Skoda Superb is a fine car all round and the Elegance trim Combi version we had on test offers the same luxurious leather upholstered cabin of the saloon with the added advantage of an even bigger boot. On the outside, it’s long and elegant looking, with roof rails lifting it somewhat. This estate model is huge – with fantastic legroom both in the front and in the back and it also boosts a enormous boot. Rear legroom has to be talked about – it’s truly remarkable. Two adults would fit comfortably in the back and there’s a decent sized middle seat in between. There’s also a rear display located between the front seats, which shows the external temperature as well as the time. The Superb is full of what Skoda likes to call Simply Clever ideas and the two pop-out cup holders in the centre pull-down armrest/storage box are an example. The boot dividers are also Simply Clever. One of the disadvantages of having a large boot is that there’s nothing to prop things up against if you only have small items that you don’t want rolling around – a couple of bags of groceries for instance. 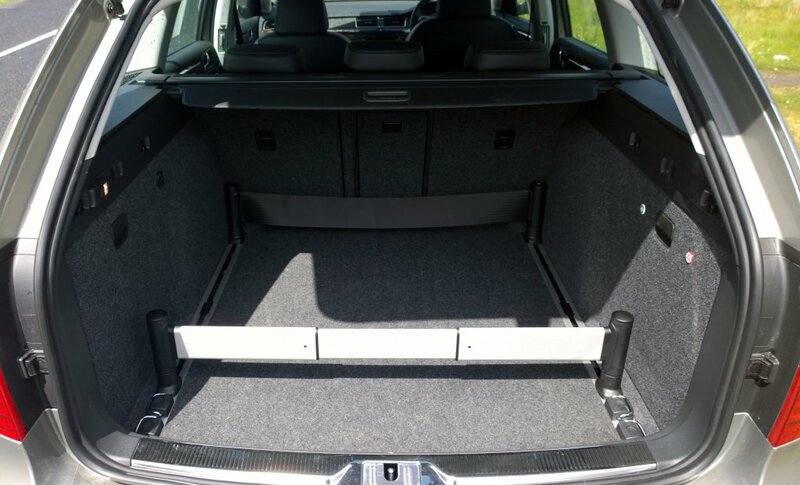 However, Skoda has overcome this problem with slidable boot dividers that you can set up to suit your needs. The already enormous boot can be made even bigger by folding and flipping over the rear seats. The cabin in the top of the range Elegance model I was driving is close to premium, at a more affordable price, and the test car was fitted with front heated electric seats, with memory settings on the driver’s. There was also easy to use cruise control, SatNav, easy to set up Bluetooth phone and music streaming, air conditioning and front and rear parking sensors. The test model also parked itself and Park Assist for parallel parking is standard on the Elegance trim. While the infotainment unit in general was easy to navigate with a great built-in hard drive, unfortunately the same can’t be said for the actual SatNav system – it’s adequate but needy. Unusually, there isn’t a USB port to be found in the cabin. I think the parking ticket holder on the windscreen is a great idea. It’s something Skoda has been offering for years and I’m surprised a lot more manufacturers haven’t followed suit. I also liked the umbrella stowed away in the door pocket and the removable LED torch in the boot. I’m not a big fan of the default locking system thought. It’s a really annoying safety feature which only unlocks the driver’s door when you get out of car. To open the rear door from the outside you have to use the key fob. 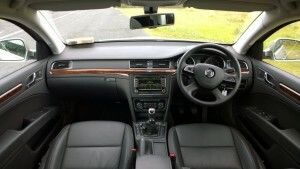 The Skoda Superb Combi is a huge car – it has a huge cabin and a huge boot but surprisingly it doesn’t feel huge to drive. In fact, the only time you really notice its size is when you look in the rear view mirror and see just how far back it is to the tailgate. Our test car was a 1.6-litre 105hp diesel manual and it felt wonderful on the road. It’s strong and powerful with a nice long range between gear changes. It’s really agile for its size and we had great fun with it on the mountains. It handles well with little body roll. It’s also easy to park (when you’re doing the job yourself) and it’s not as wide as you’d expect it to be. It’s a car that belies its looks in every sense – and we spotted quite a few surprised faces in our rear view mirror. Because of its size, people expect it to be slow and sluggish at the lights – but it’s not. 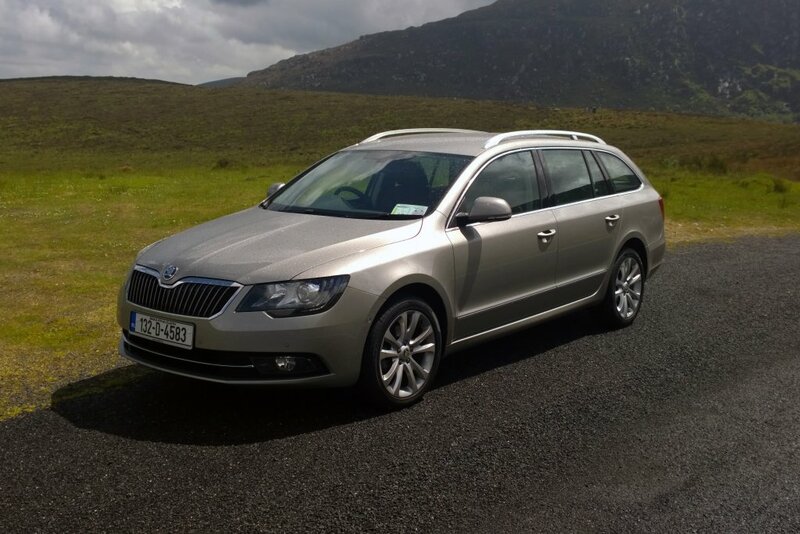 Overall, the Skoda Superb Combi is a great family car – it ticks all the boxes. It’s a great size, great spec and a great drive. The Skoda Superb Combi is available now, with prices starting from €27,495. The Elegance model I was driving costs from €34,215. Visit the Skoda Ireland website or its Facebook page for further details.